This kids Bible lesson is based on the story from Acts 1 where the Apostles see Jesus ascend to Heaven. This lesson plan was first taught in children’s Sunday School but could be modified for children’s church. Be sure to note the links at the end of this lesson for even more learning activities that go along with this passage. Supply List: Butcher Paper, pencils, crayons or markers. Learning Goal: The aim of this lesson is to help students to understand that believers are never alone because the Holy Spirit lives inside their heart. Learning Indicators: Students will discover truth about Jesus’ resurrected appearances by reading Scripture verses together. The review questions allows the students to demonstrate their knowledge of the key events and people in the lesson. Test: Students will be able to answer the review questions. The following is a guide to teach Acts 1. Provide Bibles for students who did not bring one. Let’s turn in our Bibles to Acts 1. Review with the class what they remember from last week’s overview of Acts 1-9. Before we get into Acts chapter one, I would like for you to think about if there has been a time when you felt abandoned and all alone? Maybe you have been in a store with your family and you were distracted by something you were looking at and when you looked around your family was gone. At that moment how did you feel? When a person is left all alone he/she may feel abandoned or deserted. For the few minutes you were deserted by your family members you may have felt very frightened. As soon as you were reunited with your family you were so relieved and comforted to not have been truly abandoned. Jesus’ disciples spent three years following Him. They heard Him teach about God’s Kingdom and witnessed Him perform many miracles. When they saw the Son of God nailed to a cross and die they may have experienced feelings of abandonment. They believed Jesus was God’s Promised Messiah and now He was dead and His body had been placed in a sealed tomb. Even though the disciples had been told by Jesus what to expect they were most likely frightened and overwhelmed when the things that Jesus said would happen were taking place. It would not have been easy to watch the innocent Son of God be treated like a criminal and be nailed to a Roman Cross. It was very traumatic and unsettling for Jesus’ disciples. Sometimes feelings of fear, sadness, or loneliness can cloud our hearts to the truth that Jesus has spoken to us from His Word. The Bible is full of God’s instructions for His people to follow until He returns or calls them home. When we have feelings that seem to overwhelm us we need to find out the truth from reading God’s Word. Three days after Jesus was buried in a sealed tomb God raised Him from the dead! He did exactly what He told the disciples He would do. To prove that Jesus was really alive and not a figment of the disciples’ imaginations, Jesus stayed on the earth for 40 days after His resurrection. Let’s look at Acts 1:3. Luke tells us that over those 40 days Jesus gave many convincing proof of His resurrection. It must have been so comforting to the once very frightened and discouraged apostles to have Jesus with them again. Jesus gave His apostles a very important instruction. Read Acts 1:4-5. Jesus knew what God’s plans were and He was preparing them for when He returned to heaven. The apostles didn’t fully understand what was about to happen. Even though they didn’t understand they needed to follow the instructions Jesus gave them. God’s plan was for Jesus to return to heaven. Jesus had chosen His apostles to be messengers for Him after He left. What message did Jesus want His apostles to tell others? Matthew 28:19-20. Although Jesus was returning to heaven He was not abandoning His apostles. God never leaves or abandons His children. Let’s look at Acts 1:8. If you were here last week this was our memory verse. This verse helps the Apostles to know that they would not be abandoned and left alone. Jesus told them that God was going to send the Holy Spirit to give them His power to take the message to all people. This message could not be taken to the people without God’s power. It was important for the Apostles to obey Jesus’ instructions and wait in Jerusalem for the Holy Spirit. 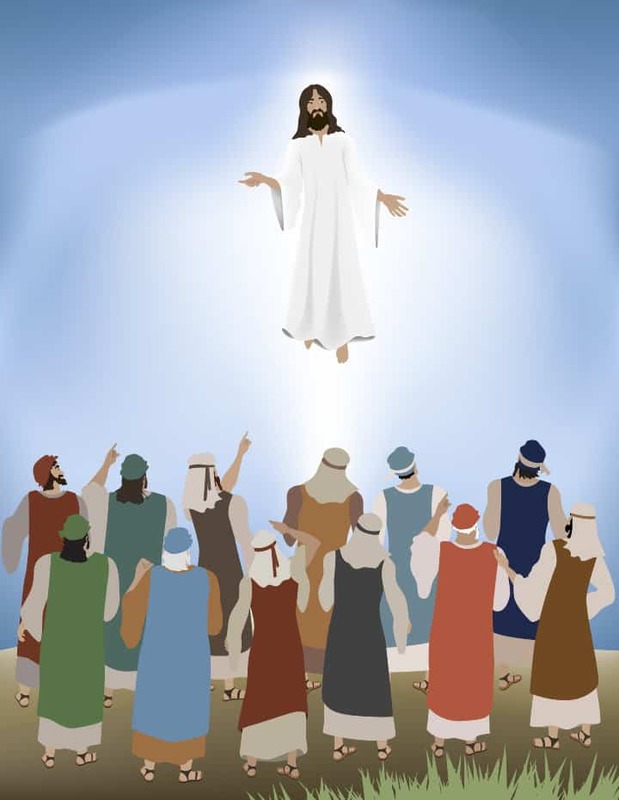 When Jesus finished instructing the apostles, His feet lifted off the ground and He began to ascend or go up into the sky. As He went up into the sky a cloud hid Him from the apostles’ sight. Let’s imagine being there on that day. Do you think the apostles strained to see Jesus and try to get just one last glimpse of Him? As we read this passage we can see God’s faithfulness to send these two men to give this message. I wonder how long they would have stood there staring up into the sky if they had not received this message from the 2 men. The apostles had a job to do for the Lord Jesus. They had work to do but first they needed to follow Jesus’ instructions. He told them to stay in Jerusalem and wait for the Holy Spirit. They obeyed His instructions and went to Jerusalem. They went into a room where they were staying. Let’s find out who was in this upper room. Read Acts 1:13-14. Two men selected based on the requirements were Justus and Matthias. The apostles prayed and asked God which one He had chosen to replace Judas. The man chosen to replace Judas was Matthias. It would have been easy for the apostles to sit around feeling sad that Jesus had returned to heaven. Instead they chose to obey Jesus’ instructions and wait in Jerusalem for the Holy Spirit. They didn’t just waste time as they waited, they spent their time praying and waiting. The apostles would miss having Jesus walk with them and being able to see His face. Very soon God would be sending the Holy Spirit to them. The Holy Spirit will always be with them and go wherever they go. The Holy Spirit would give them power to do the important job of sharing the Good News with other people. After reading about the early days before Jesus returned to heaven we can be encouraged that Jesus has not left us alone. He has not abandoned us. If we believe that He died on the cross for our sins and was raised to life on the third day, the moment we believed His Holy Spirit came to live inside our hearts. We will never be alone and wherever we go, Jesus goes with us. If we ever feel sad, alone or confused we have the entire Book of the Bible to instruct us how to live our lives while we wait for Jesus to return or until He takes us to be with Him in heaven. Next week our lesson will be about when God sends His Holy Spirit on the day of Pentecost. We hope you will not miss it! Who are some people that Jesus appeared to in His resurrected body? What instructions did Jesus give His disciples before He returned to heaven? Why were the apostles staring up at the sky? How did the 2 men say Jesus would return? Where did the apostles go after Jesus ascended? Name some of the people who were gathered in the upper room. What did the apostles do after Jesus returned to heaven? Who was chosen to replace Judas as an apostle? Need More Ideas for Sunday School? Then browse our list of kids Bible crafts or find a Bible Coloring page to accompany this lesson. Great lesson it was very helpful for me to prepare my Sunday class. Gave me a better idea of how to laid it for the kids to understand and engage at the same time. Thanks for always sharing such helpful lessons. Ps . Another way we can show the kids that Jesus is with us all the time,is by writing a hidden message on a white piece of paper with white crayon and then dipped it in red color water. We may not see it but he is with us. Tony Kummer (Editor) reviewed & updated this page on : May 23, 2018 at 9:50 am. All our content is peer reviewed by our readers, simply leave a comment on any post suggest an update.